Last night, Monica and I were having lots of fun walking around in Berkeley, trying to find somewhere to grab a bite. She had to drop off something in Berkeley for work, and asked if I wanted to come along. Of course. After she was done, we figured we might as well hang around, since we don’t get out to the Bay that much. We walked around somewhere near Telegraph Ave. or College Ave., or one of those cool streets with lots of little shops. As we were crossing the street, I saw a palm reading shop, but it was closed. We talked about how we both kinda always wanted to do it, but never really got around to doing it. After a while, when we couldn’t really find anything that was a) open and b) suitable to our tastes at the time, we went back closer to Cal’s campus, where I knew that lots of places would be open until late. Driving south on Telegraph, we got into Oakland territory and figured we were kinda lost. But at the corner of Telegraph and Alcatraz, we saw a sign. We walked up to this white house, late at night. 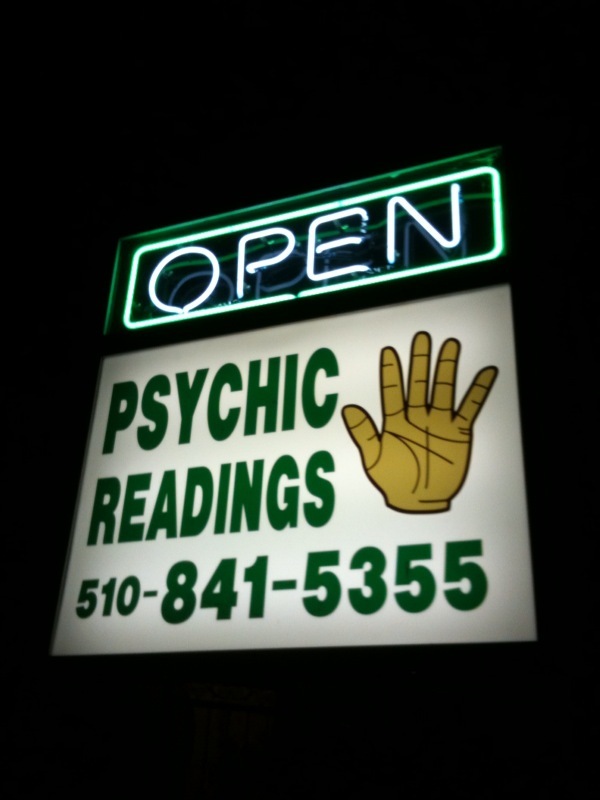 On her front window was a banner that said “Palm Reading $10” It was a little spooky, but we were excited to try this. We figured, why not? If she was a phony or crazy, we were just out 10 bucks. A nice woman opened the door after I rang the doorbell, and told us that she could only take one of us at a time. She had a little room in front of the main part of her house with a table and two chairs. I asked Monica if she wanted to go first, because she was a little scared. I wanted her to get it over with, and not be waiting outside, letting that emotion brew. She was in there for a good 20 minutes. All throughout, I was just curious what they were talking about. I could hear laughter. I could hear silence. I thought they were getting into some really deep stuff, and I got a little scared, too. Eventually, Monica came out. She looked a little surprised. I went in and the psychic, Nasta, asked me to think of two wishes and to tell her one that I felt comfortable sharing. I told her about this job that I was going for, that I really wanted. Nasta asked if I thought I would get it. I told her I didn’t know. I hoped so. What she told me next kinda surprised me. Then again, I am easily amused, but I’d been talking to her for maybe 2 minutes. Nasta said that I second-guess myself too often and that I need to have more confidence (that’s 2-for-2 so far). She said it’s something I’ve been getting better at over the last five years (and people at the Daily Aztec can attest to this), and that something I will continue to improve over the next five years. She said I was on a good path right now, but the time wasn’t right for a reading and I should come back in late March. Then Nasta added that I have some psychic energy as well, and she asked if I ever use it. “Well, I am a reporter,” I said. As we walked back to Monica’s car, I asked her what they were talking about for so long, but she said she couldn’t talk about it for 9 days. After dinner, she started writing it all down, so she could remember later on. She said she could tell me that Nasta confirmed some things she thought about herself and really looked deep into her. I kinda figured shops like these would have scamming psychics just wanting to take my money, but she really surprised me by not charging. I do plan to come back to see Nasta in March, since she seemed honest and trustworthy. Next Post Jerry! Jerry! Jerry!